I continued my neverending journey through my game library this weekend, and wound up playing through the entirety of Wheels of Aurelia. This narrative-focused driving game is set in 1978 Italy, and this historical background wound up being the real star of the experience. For those unaware, the Italian political climate was forever changed with the kidnapping and subsequent death of former Prime Minister Aldo Moro. It’s a time period filled with high tensions, terrorist attacks, and is a pivotal moment in history. It’s also a drastic tonal shift from the early moments of Wheels of Aurelia, which starts off with a leisurely drive on the historic road known as the Via Aurelia. The initial nighttime drive offers a brief reprieve from the stress that otherwise dominates the air of the time. Things quickly pick up, though, as players pickup hitchhikers, learn their stories, and occasionally go on misadventures of their own. There’s not much dialogue to get through in Wheels of Aurelia (each playthrough is less than 20 minutes long), but each conversation eventually leads to the gigantic elephant in the room: the political climate and the kidnapping of Aldo Moro. Even the luxuries of the road can’t offer an escape from the very real issues impacting the country. A lot of issues popped up while I was working my way through Aurelia‘s 16 different endings, but one thing that never faltered was my issue in the source material. Occasionally, different topics would be highlighted on-screen, and I was able to look at an in-game encyclopedia of sorts to learn more. I did this a few times, but it largely resulted in me pausing the game in order to lookup more about Italy’s turmoil online. I went into Wheels of Aurelia with little knowledge of Aldo Moro, and while this is far from the best way to learn about the kidnapping case, it undoubtedly ignited my interest in learning more about the political figure. In this way, Aurelia winds up being a triumph. It serves to not only tell its own story, but also to inform of the time period. Like a lot of historical fiction, the real life events that serve as the background are far more interesting than anything an author can conjure up. Without using 1978 Italy as a setting, I doubt I’d care enough to write about Wheels of Aurelia. However, it does, and I wound up being won over due to my desire of always wanting to learn something new. Wheels of Aurelia is certainly not the first game to portray a fictional event within actual history, as even popular game series like Assassin’s Creed feature the allure of turning back the clocks and getting to interact with some of the biggest figures in history. However, what’s interesting is that Aurelia focuses less on the key figures of the time, and more how the political events have an impact on regular citizens. The story also serves to show how much significant social progress has been made in the decades since. 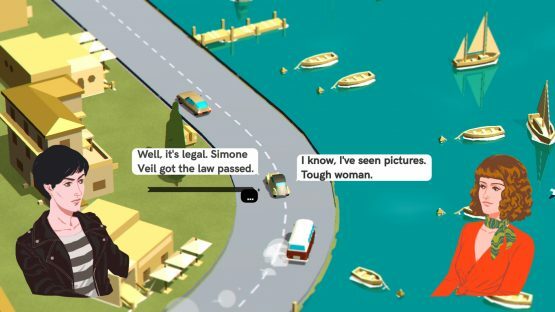 One of the characters whom players meet during their road trip is a young pregnant woman, that is looking to exit Italy as she contemplates an abortion. This means needlessly having to put herself in danger, during what is already a mentally exhausting and difficult time in her life. Later in 1978, women would gain the rights to control their own bodies. I’d love to see more games in the future explore moments in history. Even when the historical settings are just used as a backdrop for another story, they still add so much flavor to the experience. Wheels of Aurelia could still be interesting if it was just about meeting hitchhikers and hearing their stories, but I doubt I’d still be reading about its themes days later if it wasn’t for it using such an interesting moment in history as a base. 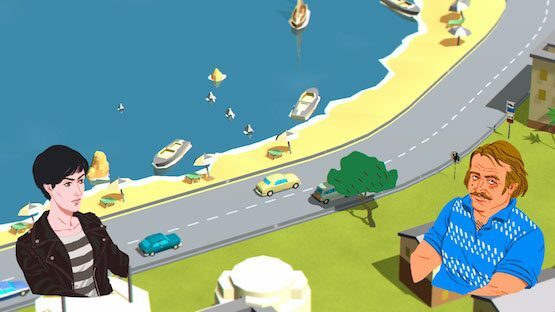 Wheels of Aurelia is available now on PlayStation 4 for $9.99 on the PlayStation Store.